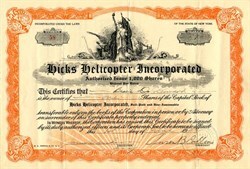 Beautiful certificate from the Hicks Helicopter Incorporated issued in 1932. This historic document was printed by W.N. Perrin & Company and has an ornate border around it with a vignette of the Statue of Liberty, an eagle, and a globe. This item has the signatures of the Company's President, Anson B. Collins, and Treasurer, James M. Dirkson and is over 76 years old. Collins, Anson B. � of Mechanicville, Saratoga County, N.Y. Republican. Mayor of Mechanicville, N.Y., 1938-39; alternate delegate to Republican National Convention from New York, 1940; member of New York Republican State Committee, 1961.